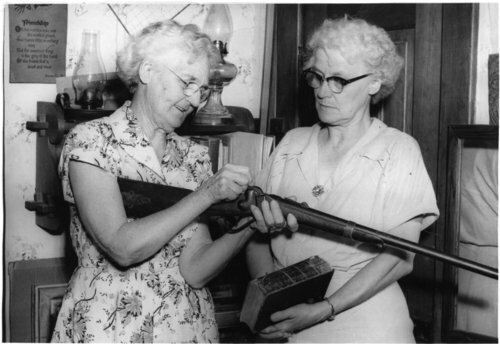 Photograph of Maude Josephine Mitchell holding a rifle and Josephine Willig Brown holding a bible. This picture was taken in the Mitchell home in Wabaunsee, Kansas. At one time these articles were on display in the Wabaunsee County Courthouse but were removed to the Menninger Museum in Topeka. The rifle is now on display at the Wabaunsee County Historical Society Museum in Alma, Kansas. Captain William Mitchell's Bible, the only known copy of an original "Beecher Bible" is in the archives of the Mabee Library at Washburn University. A similar photograph taken at the same time accompanied an article published in the Kansas City Times on August 21, 1957. The caption read, "Descendants of founders of Wabaunsee pose here with a Sharps rifle and a Bible carried by the first settlers. They are Mrs. Josephine Willig Brown (left), granddaughter of John Willig, and Miss Maude Mitchell, now 80. They were photographed in the log cabin built by Miss Mitchell's father, which once sheltered runaway slaves. Miss Mitchell's present home was built around the cabin." Maude Josephine Mitchell died on October 15, 1957, not long after this photograph was taken.